Diners are seated communally at Kobe's three hibachi tables. 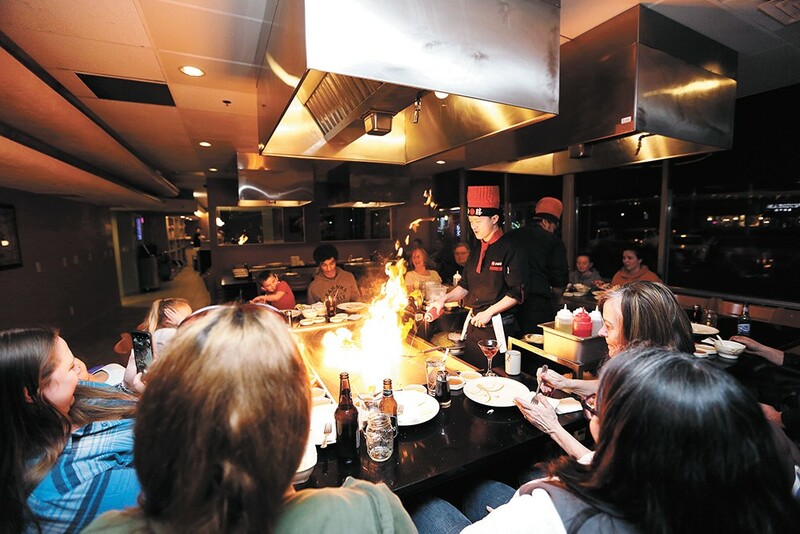 On any given night, the hibachi chef's theatrical shouts, mixed with gleeful reactions from diners of all ages, carry throughout the dining room of Kobe Hibachi, Sushi and Bar. If you're not sitting at the recently opened Japanese restaurant's hibachi table, where menu items are prepared fresh on the grill directly in front of diners, you may feel as if you're missing out. The performance-based cooking sometimes includes arcing shots of sake (Japanese rice wine) from a squeeze bottle aimed directly into customers' wide-open mouths. The lively chefs also tend to get a little carried away with their flame-wielding prowess, sometimes setting their tall chef's hats alight (safely) at the end of the meal's preparation. If performance-style dining at a communal table isn't your preference, Kobe offers all of its menu items off of the grill and from the sushi bar in a separate dining room. (Likewise, sushi and other non-grilled items can be ordered from the hibachi tables.) The restaurant's sushi bar side is a little quieter, with cozy booth seating along a wall of windows, or at stools along the sushi bar. Opening in fall 2017, Kobe took over a large pagoda-inspired building on north Division Street formerly home to the Chinese restaurant Kaylon Garden. 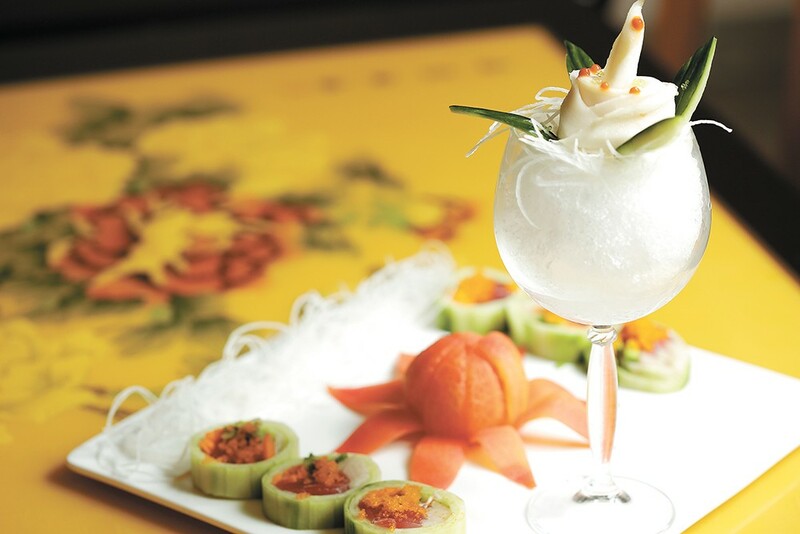 Kobe's owner David Cao spent nearly 10 months renovating before opening last October. Though it retains some of the Asian-inspired decor and atmosphere, restaurant manager Sarah He says the space was pretty rundown when Kobe took ownership. "Inside is totally different. If you come in the door, on the left side is the hibachi and the right side is sushi dine-in," He explains. "We also do lunch and have [done] a lot of investment into the grill — all of our kitchen is upgraded to fit the Japanese requirements for teppanyaki." A cucumber roll from Kobe's sushi bar. "At first, customers were scared because they don't know what hibachi is," He says. "They know teppanyaki, not hibachi. East Coast restaurants have [hibachi] a lot and that is why we call it that, not teppanyaki." He says hibachi-style restaurants are popular in Japan, but the culinary performance element isn't as much of a focus there as in the U.S.
"It becomes a show with the meal, so that is different," she says. "People kind of can have a show and still have very good food. It's good for family gatherings and special events — holidays, birthdays and company meals together." All of the food, from the fried rice to vegetables, noodles and many different proteins, is prepared on the grill. At Kobe, each hibachi meal comes with soup, salad, veggies and a side of fried rice or noodles. He says the meals ($12.75-$36.95) are very customizable, with several meat or meat combinations to choose from, starting with the basics of chicken and beef, and a wide variety of seafood including salmon, shrimp, lobster, red snapper and scallops. For younger diners, a special kids' menu offers smaller portions ($12.95-$15.95). Kobe's three hibachi chefs have worked, respectively, in similar restaurants in Las Vegas, Chicago and Spokane. They each take a uniquely personal approach when interacting with customers, He says. "Some of them like to play jokes, some like to play with fire." The restaurant's three hibachi tables are open for service throughout lunch and dinner (service takes a short break on weekdays between 2:30 and 4 pm), with expedited service offered at midday to cater to customers on lunch breaks. Service at the hibachi table is scheduled to begin 15 to 20 minutes after the first customer is seated there, after which diners are served first courses of soup and salad before the chef begins his work, which He says takes about 20 minutes. While hibachi-style cooking is Kobe's focus, the restaurant offers a multi-page menu of traditional Asian cuisine, including bento boxes, tempura, teriyaki, katsu (breaded and fried meats) and udon noodle entrées. With a secondary focus on sushi, Kobe devotes several pages of its menu to describe its wide variety of raw and cooked rolls, including maki (rice-based rolls), temaki (a cone of nori), sashimi (single pieces of raw fish) and nigiri (raw fish atop a small mound of rice). "The sushi we have are a lot of recipes from the East Coast," He says. "They are in touch with Japanese and Asian foods, and we have all sorts of things for beginners, sushi eaters and non-sushi eaters." She mentions the Kobe roll ($14.50), a house special that's made without any raw fish. Inside the outer layer of sticky rice is thinly-sliced beef with a sweet pepper rub, onion and provolone cheese, topped with eel sauce. The menu includes a variety of vegetable-filled rolls with choices such as sweet potato, avocado, cucumber and asparagus ($4.95 each). "We have a lot of levels for people so everyone can get a taste of it even if they don't like sushi," He says. The original print version of this article was headlined "Dinner as a Show"